Well what do we have here, frankly a pretty amazing thing, when the music found its way to our offices Ian thought this was some old material, really cool old material, in fact hailing from the 60's and 70's. Rocking and powerful and utterly compelling .. and what did we actually have? .. well read on .. and we're booking in all territories, quite amazing! Founded in the summer of 2013, under a different name, with Dominik "the bass" Schraml playing the bass, Robert "Tight Tock the Beatmachine" Wiese on the drums and Nicolai "Slidemaster 3000" Halaczinsky on the organ and the synthesizer. The band, which in its early phase still featured guitar, was initially intended to enrich the music scene of Graz as yet another stoner rock project. However, it soon turned out that the project would move in a different direction. In March 2014, Andreas "Bacchus" Bachleitner joined the band as singer and sax player, completing the band's setup. 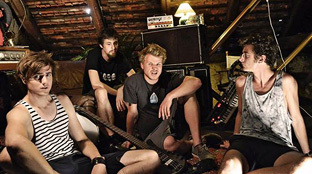 Over time, the band members' different musical influences from punk, grunge, funk, psychedelic and stoner rock, merged into a fresh new sound. The result is a combination of a bass that seems to have directly sprung from Death Valley, psychedelic synth sounds, catchy organ melodies reminiscent of 60s rock, drums somewhere between Bonham and Chad Smith and a voice that would make Joe Cocker's blood freeze. From then on, the four musicians were ready to shake up the music world.